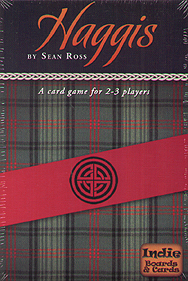 From the green hills of the Scottish highlands comes a card game stuffed full of fun. The goal is simply to play all of your cards first. But beware, hidden in the misty crags are subtle strategies that require mastery of tricky combinations, wild cards and... "bombs". Sharing a common lineage with the ancient card games of China, Haggis is a delicacy reserved for tables of two or three.